The Monte Cristo building is a large adobe building with a characteristic ‘old west’ false front. It was built in 1880 by Mr. Austin Crawford (who also built the Doodle Dum). The original structure consisted of two fairly large rooms. It is thought that the front room was the saloon and the back room was the dance hall. In 1884, the City Fathers found that there were a number of children in town but there was no school. The city leased the building from Austin to be used as a school. Eventually a new school building was constructed, and the saloon building then was used for a number of activities. At times it was used as a mining company headquarters, a storage facility for mining gear, and a residence. In about 1900, a room was added at the rear and an assay furnace was installed. The building then served as the assay office. 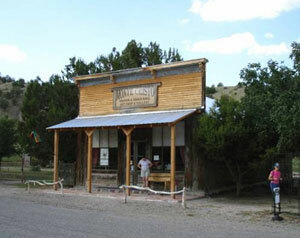 The building has been restored and is now the Monte Cristo Gift Shop & Gallery. It is operated by a co-op of local artisans, and is open 7 days a week from 10am - 4pm.